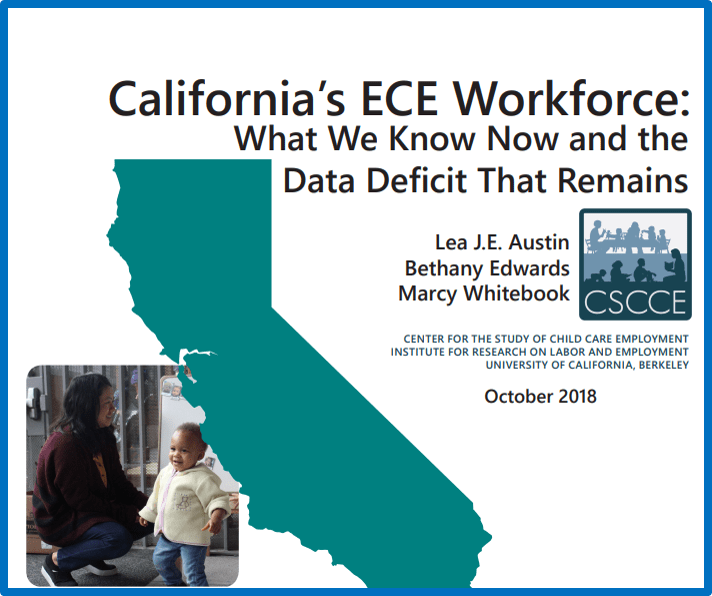 Today, we released a new report, California’s ECE Workforce: What We Know Now and the Data Deficit That Remains. The 2006 California Early Care and Education Workforce Study, conducted by the Center for the Study of Child Care Employment (CSCCE) and the California Child Care Resource and Referral Network, provided an in-depth portrait of the center-based and licensed family child care workforce across the state and regionally. Yet 12 years after this study, California lags behind a majority of other states when it comes to the status of its workforce data, and the absence of an updated statewide survey or a statewide workforce registry creates numerous challenges to the implementation of evidence-based decision making. For advocates, policymakers, and other stakeholders seeking information about the workforce, there is a demand for data in the interim. This brief directs stakeholders to three more recent, though not comprehensive, sources of information about the California early childhood workforce: 1) local workforce data sources from three counties; 2) annual federal data collected by the U.S. Bureau of Labor Statistics; and 3) California-specific data drawn from the 2012 National Survey of Early Care and Education.